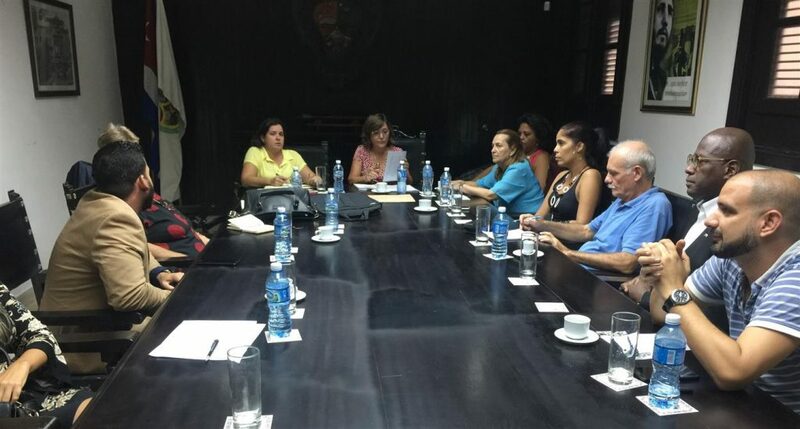 On the occasion of the invitation to participate in the 33rd Latin American Chemistry Congress and 10th Congress of Chemical Sciences, Technology and Innovation, the Rector’s Delegate for Strategic Development, Pepa Muñoz Cueto, visited the University of Havana. There she held various meetings with International Relations leaders of the UH, as well as with those responsible for other priority areas. The Rector’s Delegate for Strategic Development was greeted, among others, by the Vice-Rector for Information, Communication and International Relations, to which she expressed the interest of having the participation of the University of Havana in the training program for doctors in Maritime and International Law sponsored by the Ibero-American Postgraduate University Association (AUIP). The attendants to the various meetings held by our Delegate, whom were transferred the intention of the University to count on their participation, showed their interest in the proposals and expressed their willingness to take part in them. The stay of the Rector’s Delegate concluded with the visit to the facilities of several laboratories where they develop some innovation & training activities that may be of interest to generate collaborative actions between the two institutions.